Spirit LS Laser Engraving Machine comes with excellent output quality, reliability and is user friendly. The LS has an array of innovative and useful engraving features that set the standard as the industry benchmark for laser machines. A perfect addition to any business. The ramping process is reduced so increasing productivity and lowering the job running time with this ground breaking technology.. Superb output quality under rapid movement is delivered with the systematic and reliable motion system embedded with strong mechanical framework, reinforced Kevlar belts, and accurate servomotor control technology. 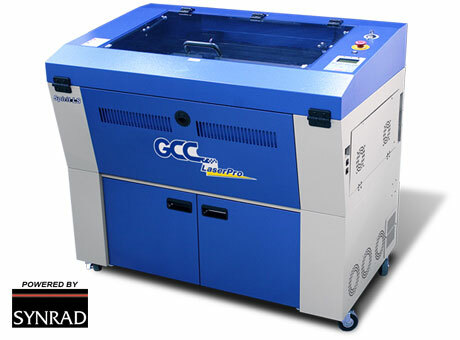 The CO2 laser is a critical part of a laser engraver. GCC Laserpro offers the best and most reliable CO2 laser available in the industry. Synrad* CO2 lasers are built in the United States with the most advanced laser technology. All GCC products are RoHS-compliant (the European Parliament Directive 2002/ 95/ EC, Restriction of Hazardous Substances) and lead-free (pb free).